I heard about Volkswagen discussing the possibility of a new, electric, MEB-archicture Kübelwagen or Thing a couple days ago, but was hesitant to write about it because, well, I’m not sure if it’s just idle talk or if there’s some grain of seriousness behind it. I guess it doesn’t really matter, because it’s interesting enough it’s even being mentioned. So, before we get too Thing-crazy, let’s look at what he’s really saying here—that their new MEB electric, modular platform is really flexible, and that VW has a crapton of interesting history to pick through to potentially resurrect, and since MEB is all-wheel drive capable, a new Thing could be a possibility. Referring to the car as a Kübelwagen is sort of a strange choice, since that car was built only for Germany’s WWII use, which, as you may guess, doesn’t exactly have the best PR optics. The modernized version of the Kübelwagen (well, late ‘60s, early ‘70s modern), the Thing, has a much friendlier reputation in America, and, if this happened, is the far likely candidate for a name revival. Diess also hints at MEB taking on sort of the role that the original VW Beetle chassis had—as a platform for a wide variety of kit bodies, dune buggies, and so on. I’d personally love to see a rebirth of a flexible platform like that, fostering a the creative kit car explosion cheap old VW pans once made possible. This is all very interesting, and an unusual amount of candor about the future from an auto company executive. I’m not sure if I feel like this means a new Thing, but the exciting thing is that it could. I suspect that a lot of this has to do with how flexible the MEB platform proves to be once in production. 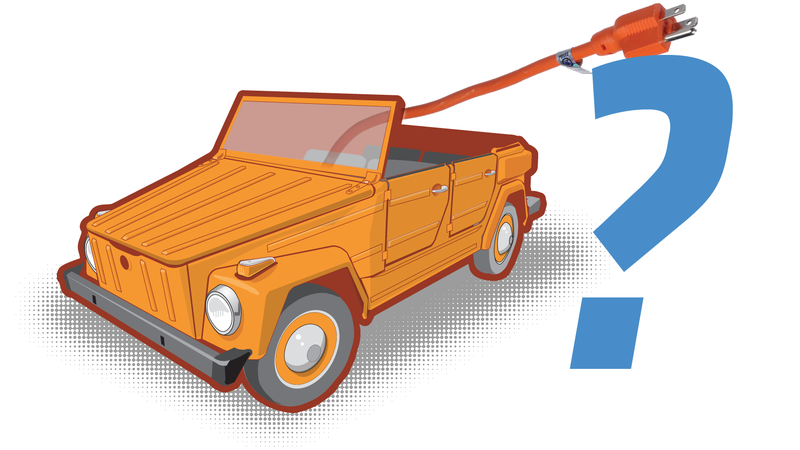 I’m going to be cautiously hopeful about a re-born, electric VW Thing. I’ll know how hopeful I’ll let myself be once we see what happens with the new Microbus. And then I’ll hope for a new Brasilia, Fridolin, and Country Buggy.